All total of 17 steles can be visited, all on the south bank except for one on the north bank. 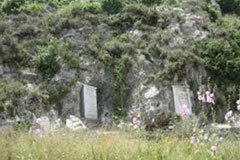 Each inscription is numbered, and a stairway leads to those located higher up on the cliff. When Egyptian Pharaoh Ramses II marched through Lebanon over 3,000 years ago, he left three inscriptions in the rock above what is now Nahr-el-Kalb (Dog River). Over the centuries other foreign expeditions followed his example, marking their passage through this difficult place by carving their exploits in stone. The single stele on the opposite side of the river was the work of the Neo-Babylonian King Nebuchadnezzar II (604-562 BC). 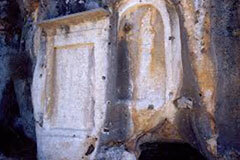 Nebuchadnezzar aslo left two copies of the same inscription at WadiBrissa near Hermel. Five steles mark expeditions made by Assyrian kings, one of whom was Assarhaddon (680-627 BC). In Roman times the third Gallic Legion under Emperor Caracalla (211-217 AD) left a stele marking road work carried out here. There are two inscriptions in Greek. One is illegible but the other commemorated more roads and engineering work. This was accomplished in 382 by Proclus, Byzantine governor of Phoenicia under Theodose the Great (379-395). Another stele commemorates the expedition that Napoleon II sent to Lebanon in 1860-1861. The pointed Arab bridge nearby is also the subject of an inscription advising us that Mamluke Sultan Barqouq (1382-1399) either built or rebuilt it, This bridge, destroyed and repaired many times during its history, was last renovated by Emir Bechir II in 1809. The 20th century also has its share of inscriptions. One records that French troops under General Gouraud took in Damascus in 1920. Two others dating 1919 and 1930 mark one event. The first stele noted that the British Desert Corps took Damascus, Homs and Aleppo in October 1918. The other relates the same story, but names Australian, New Zealand, Indian, and French contingents, as well as the "Arab troops of King Hussein", Shereef of Mecca. The British and French occupation of Beirut and Tripoli in October 1918 is recorded in another inscritption. Besides the 19 stele before Lebanon's independence, we have one marking the evacuation of foreign armies from Lebanon on December 31, 1946, and a monument to the French war dead. Finally, the bridge with three arches not far from the old Arab bridge was built by Wassa Pasha, mutassarrif of Mount Lebanon between 1883 and 1892. 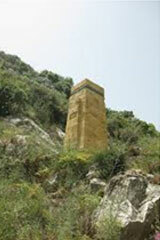 Commemorative stela of Nahr el-Kalb on the list of the Memory of the World. The stela of Nahr el-Kalb, the Lycus or Dog River, sum up the entire history of Lebanon, from High Antiquity to the present, evoking clearly the successive advances of the Pharaonic, Assyro-Babylonian, Greek, Roman, Arab, French and British armies which braved all the obstacles surrounding this difficult and very steep crossing point to carve commemorative stela on the rocks. The Nahr el Kelb site was listed by the UNESCO on the “Memory of the World Programme”, this programme was created in 1992.
to safeguard the documentary heritage of humanity against collective amnesia, neglect, the ravages of time and climatic conditions, and willful and deliberate destruction.